Did you hear the one about the newlywed who rushes off for legal advice before the honeymoon is over? Or the husbands who arrange for an enormous tub in which to cure their sugary wives with a pinch of salt? How about a participatory processional toward marriage so sacrilegious that it puts Chaucer's pilgrimage to shame? And who could have imagined a medieval series of plays devoted to spouse-swap… ping? 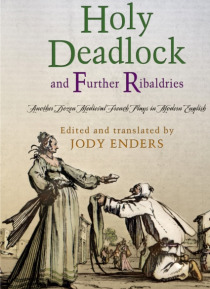 Jody Enders has heard and seen all this and more, and shares it in her second volume of performance-friendly translations of medieval French farces. Carefully culled from more than two hundred extant farces, and crafted with a wit and contemporary sensibility that make them playable half a millennium later, these dozen bawdy plays take on the hilariously depressing and depressingly hilarious state of holy wedlock.In fifteenth- and sixteenth-century comedy, love and marriage do not exactly go together like a horse and carriage. What with all the arranged matches of child brides to doddering geezers, the frustration, fear, anxiety, jealousy, disappointment, and despair are matched only by the eagerness with which everybody sings, dances, and cavorts in the pursuit of deception, trickery, and adultery. Easily recognizable stock characters come vividly to life, struggling to negotiate the limits of power, class, and gender, each embodying the distinctive blend of wit, social critique, and breathless boisterousness that is farce. Whether the antics play out on the fifteenth-century stage or the twenty-first-century screen, Enders notes, comedy revels in shining its brightest spotlight on the social and legal questions of what makes a family. Her volume defines and redefines love and marriage with a message that no passage of time can tear asunder: social change finds its start where comedy itself beginsat home.